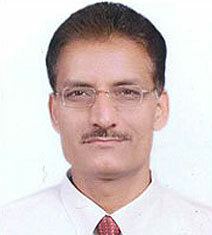 Dr Sushil Prabhakar has taken over as Registrar of the Guru Angad Dev Veterinary and Animal Sciences University (GADVASU), Ludhiana from 16th April, 2015. He is an eminent Scientist in the field of Animal Reproduction and has worked extensively on calving abnormalities in buffaloes. Dr. Prabhakar has put in more than 28 years of service in different capacities including service as Head of the Department of Teaching Veterinary Clinical Complex and Controller of Examinations, GADVASU. Dr Prabhakar has published 175 papers in different international and national journals of repute besides presenting papers in several international and national conferences. He has guided 7 MVSc and one PhD student. Dr Prabhakar has pursued post-doctoral fellowship at the University of Liverpool, UK. He is the fellow of the Indian Society for the Study of Animal Reproduction (ISSAR). Dr. Prabhakar has been bestowed with several awards and honours for his scientific contributions. He is a member of several national scientific societies.